I remember the night I wrote the very first bolg post-- we were sitting on our couch, the Nag pregnant with the Wah and me a little too excited over my dream (not an “I have a dream, dream” as I explained to ESPN) about this silly idea about starting a bolg about going to the zoo with Roy Halladay. I figured it could never happen, but for some reason a small part of me felt that there was something unique about the whole endeavor. I couldn’t explain it then and it seems I can’t either now. It just felt right in the way things that feel right feel. Of course, the largest portion of that “rightness” was found in that ZWR provided a creative outlet, as well as a chance to give voice to things I wouldn’t say without the benefit of anonymity. I’ve never felt the need to live in character, but I love this penguin. Beyond me, the site has given life to an incredibly smart and funny shared community that just gets the humor it goes for. This is one of the most amazing parts of ZWR, and it’s all because you donkeys rule. I cannot thank you enough for how much your support has meant and the smiles/laughs you’ve given me. But now that he’s retired, my how things have taken a turn! Roy joined Twitter this year and instantly endeared himself to the fanbase in a new way-- namely posting selfies of himself eating ice cream and flying planes and talking about cropdusting the remainder of the Four Aces (and Joe Blanton). The man who broke faces with his intensity is now breaking them with hilariousness and a playful side that we never got to see as a player. For instance, the Nag saw one of his recent tweets and said that he’s adorable; in 2010 could you imagine anyone on the entire planet calling Roy Halladay adorable? No. The answer to that question is no. I never expected it to happen, but in a lot of ways Roy’s post-retirement fun side has blended perfectly with the bolg ethos. He also really seems to get it. And I guess today kind of proves that. Well, basically everyone! Obviously, first and foremost I want to thank Roy and Brandy Halladay. Then Bonnie Clark and the Phillies, who approached me to set this whole thing up a while ago, and who have shown incredible tolerance about some of the nonsense I've posted here, particularly of late. Like, she literally called to break the news to me the same day I posted a skit about Ruben Amaro making a three-way trade with a dog and a toddler. To think that these people took time to plan a meetup at the zoo for an idiot like me is pretty startling. Then, of course, thanks to the Philadelphia Zoo for hosting us. Go to the zoo, folks, it’s amazing. Even if you’re not with Roy Halladay. I guess I’ll throw a head nod Ryan Lawrence’s way here, too, though I’m still not sending him a free t-shirt. Lastly, a thank you goes to The Nag. You've been great this whole time because you are great. I love you. I’m not sure. Obviously the goal of the site has been met. That said, it has become something quite important to me in terms of a creative outlet and thus far has led to opportunities I could have never imagined, including the kernel of a dream of being able to create sports humor as a career (however slim the chances may be) … so I definitely don’t think I’m going anywhere. The site may slowly change over time, but we’ll have to see. However, I’m at the freaking zoo with Roy Halladay at this exact moment, so I’m kind of feeling like truly anything is possible. Thanks again. I'm literally a little teary-eyed. This is clearly the greatest thing that's ever happened to someone who I don't know. Crying tears of joy for your crazy self. Unreal. This is so completely awesome ... and sad, too, if this post means your ending the bolg. I <3 ZWR ...and Roy Halladay is just the best of men. Dude. Wow. I got the chills. I don't know how something someone else is experiencing can feel totally surreal to me, but it does. A fine reward for a fella who does mighty fine work. Cheers. PCJ introduced me to this bolg. We are also both named Joe. And I like the Zoo, and the fact you are there with Roy. I am so happy for you! Donkey Nation rejoices with you today!!! ZOMG! TOTALLY FACE BROKEN!!! And whatever DID Roy say about giraffes??? I am giddy with excitement. This is the culmination of years of hard work and dedication! I couldn't be happier for you ZWR, Looking forward to all the great pictures of you and ROY AT THE ZOO! PS curse the Philly Zoo to hell if they don't let you and Roy hold a baby penguin. I'm sure we'll get a complete play by play from you later when you have regained consciousness. Until then, sincere congratulations on meeting the one and only Roy. Best bolg post ever. Congrats, Penguin. I'm legit proud of you for this, and you're a complete stranger. Awesome! Can't wait to go to the game tonight and add to my bobblehead collection. Way to go Zoo! Am I going to run into you guys on the Metro? Wanna go to Matchbox later? Well deserved, sir. You have been wonderfully entertaining, and consistently so, these past few years. I think I speak for everyone when I say that it couldn't have happened to a better guy. Way to go, penguin. Sincere thanks for making baseball "so funnered." Greatest day EVER! You've earned it!!!! Hope you stick around forever, though no one would blame you for eventually going out on top. Yay for ZWR and Roy!!!! This literally made me cry! This is why being a Phillies fan is the best, no matter whether they're winning or losing! Congratulations!! Going to the game tonight, and can't wait to give Doc some love!! It's a story about a stranger meeting a millionaire, yet I can't stop smiling -- what a world. Way to follow that dream. I don't know you either but this news is so awesome, when I clicked the twitter link it crashed my iPad. Or maybe it broke my iPad's face. Thank you. And Thanks, Roy. ZOMG, I'm crying. Please post ALL the details when you come back down to earth!! Congratulations penguin! May this be a day that lasts in eternity for you and all of Donkey Nation. This is a guy who had the killer instinct of a F-22 Raptor fighter pilot as he ruthlessly swept away batters to win games, including the memorable no hitter in the playoffs which was a great show he gave all of us! And today, this guy loves going to the zoo to see the animals. I have been there several times with my family and I can say that an inner peace descends upon you when you see the giraffes quietly ambling around the field with nary a care. Enjoy your night Roy and thanks for all the memories you gave all of us! this is the best day EVER for people who read bolgs. So dreams can come true if you dream weird. Face=broken! 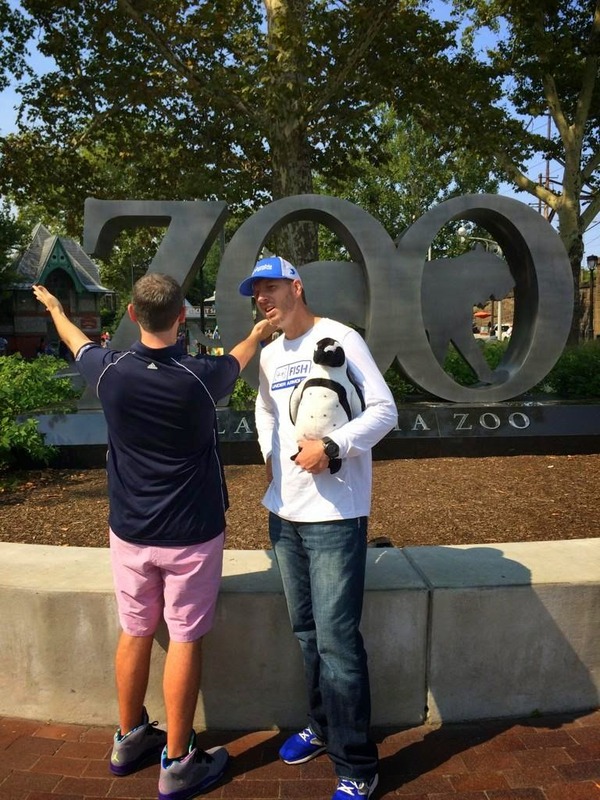 We totally need a SRHPY style recap of the day ZWR actually went to the zoo with Roy fargling Halladay! This is fantastic! These are tears of joy. Thank you for this website, Penguin. You've made the fun times even funner and the bad times seem slightly less bad. I hope going to the zoo with Roy was all that you dreamed it would be. I'm so glad to see that your dream has come true. I hope you keep writing here. You're humor is unparalleled. Did Roy get to meet SIR PERFECT MCPOPTART OF CUTTERHAM today?? Change the site name to "I went to the zoo with Roy Halladay and all he got was a cuttered t-shirt." I laughed and laughed. What a ridiculous world we live in. This is the best thing that's happened to me all year. And it didn't even happen to me! Congrats, Penguin! Couldn't have happened to a nicer bolgger. Most awesome. It was great seeing Roy at the game tonight. The pic at the top of this post simply says "Roy gets it." From a total stranger who got a lot of laughs while reading your bolg, thank you and congratulations! I cannot believe no one started a slow clap. SMPhH, bums. WTG ZWR! Couldn't happen to a better penguin. Congratulations. I consider this a triumph for creativity in all its forms. So will you share pics? What did you talk about? Did you went your pants? It would be totally understandable if you did. As pf Friday I have the top post all-time in r/eagles and I got engaged yesterday. Somehow ZWR going to the ZWR was the best thing to happen to me all weekend. Congrats man, I'm terribly happy for you. A most awesome day for the Penguin Nation indeed.